Quality or Quantity? Choose both! We train and regularly monitor every one of our certified instructors to make sure you receive the best training possible. Health and safety training is important, and you should be confident your instructor is qualified. Our instructors are wherever you need them to be. 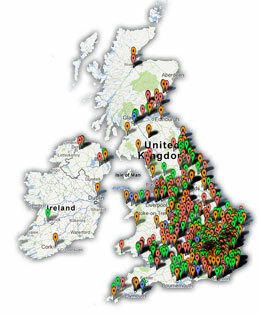 With a nationwide network that consists of hundreds of instructors spread throughout the UK, we have you covered. In a remote area of the country? No problem! We'll send an instructor to you. We frequently work with companies who have multiple locations. If this describes your business, get in touch. We'll figure out the logistics, coordinate instructors to visit each location and leave you with a single touchpoint. Sometimes it works better to handle the training internally. Many companies opt to train one of their own employees to be an in-house instructor. We'd be happy to help make this or any variation work for you. As a new ProTrainings instructor, you are choosing a partner who will support your business and help you to grow and attract new customers. You will receive the tools and resources to be an effective teacher in whichever topics you choose to teach. If you're interested in joining our instructor network and teaching the ProTrainings curriculum, continue reading about how to become an instructor. We're excited to work with you!